A mock DUI crash is a staged event that uses real vehicles and actors where alcohol is the reason for the crash. Emergency (air evacuation, police, fire, ambulance, etc) personnel respond to the scene as if it were real. These are conducted for the seniors only around prom time to raise awareness of the dangerous and deadly effects of drinking and driving. Gibson County Coordinated School Health Coordinators developed a countywide Mock Crash Drama Team who acts in each event. 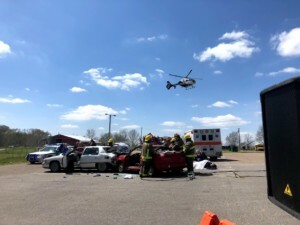 Students from each district in Gibson County were trained to participate in the simulated crash. There will be a guest speaker, Fletcher Cleaves, to address the junior and senior class on April 4. The purpose is to reiterate the reality and possible consequences of distracted driving. Juniors and seniors are asked to sign a “Prom Promise” which states that they will not drink and drive on Prom night. This is part of the Coordinated School Health program that address youth risk behaviors. The goal of this program is to address the deadly consequences of drinking and driving or driving distracted or drowsy.